Such a cute idea, I love that you added the Sixlets to the cookies it really jazzes up the final presentation and fills the holes in between the cookies so it doesn't look empty. Thank You Marlyn! I am so happy how they turned out, the Sixlets really do add a lot. What is a party without party favors? Thanks for stopping by! I love these little crowns! These jars would make great party favors. Oh...Thank you Amber. I love those little jars, they are so cute, and I thought they made the perfect size for party favors, because what is a party without party favors? Who knew something so cute could be so tiny! Wonderful things come in small packages! You know what they say, "WONDERFUL THINGS COME IN SMALL PACKAGES" Thank you for stopping by! I love minis! 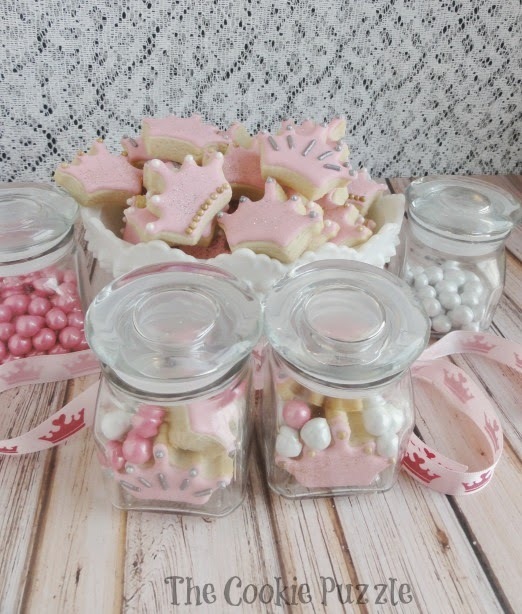 They look so adorable the way you have them presented and in the jars! CUTE! 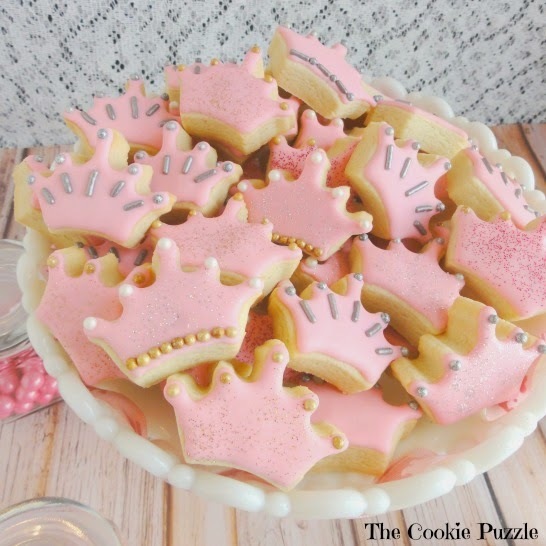 Your mini crown cookies are so cute! =) Love your photos! Im going over to visit the other cookie sites. Thanks Melissa! The other's made WONDERFUL cookies. Super cute Kimmie! And I just love the presentation and cute little jars! Great job! 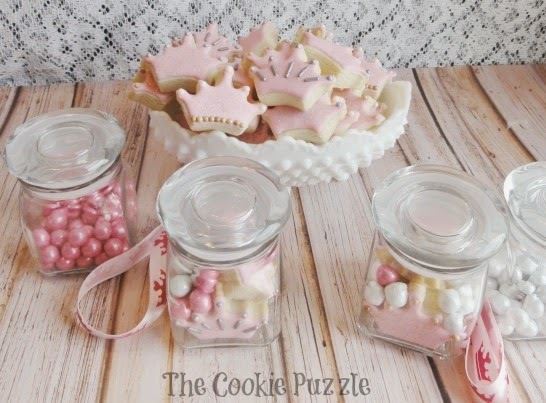 Thanks Cristin, they are simple cookies, but dressed up with ribbon, sixlets and a cute jar, I think they are fit for royalty. 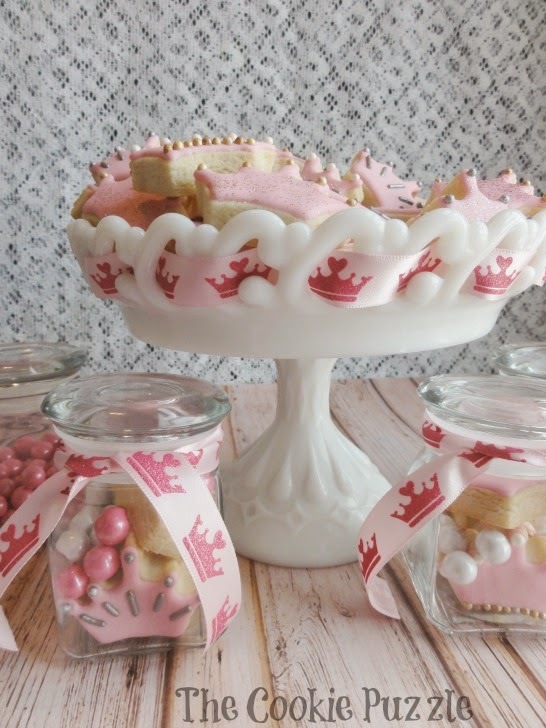 Those little crowns are the perfect treat for a royal baby shower, Kim! Love the matching ribbon too! Thank you Mike....I found the ribbon at Michael's and I just KNEW it would be perfect. I love your idea Kim! It's not a party without favors. Cookies & sixlets---what more do we need? Nutella....LOL! NUTELLA! Dang it....I should have thought of that...little Nutella dipping cups! These are just perfect. Any princess would love these. I especially love that they minis, I love mini cookies. Love the colour. It is simple but elegant. Thanks for sharing with 4 seasons blog hop. Share with my personal Facebook Group as well. Aww...these turned out SO cute! Love them! How cute are these Kim! Pinned all and thanks for sharing it at the Say G'day party!